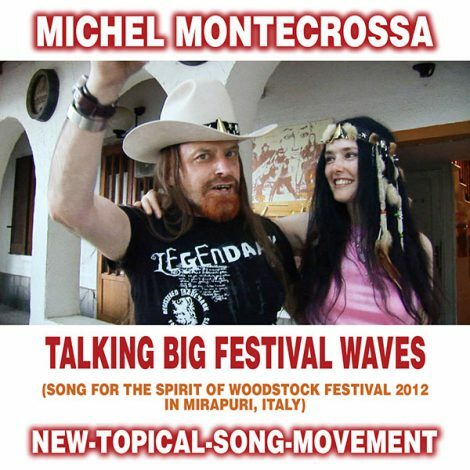 ‘Talking Big Festival Waves‘ Michel Montecrossa’s New-Topical-Song-Movement Audio Single and DVD, released by Mira Sound Germany, for announcing the Spirit of Woodstock Festival 2012 in Mirapuri, Italy. Michel Montecrossa together with his band The Chosen Few during ten days (27th July – 5th August) presents 20 concerts featuring 160 brand-new songs from Michel Montecrossa’s ongoing New-Topical-Song and Cyberrock concert tour. Michel Montecrossa and his band The Chosen Few play along with international guest bands creating together with them the stimulating and happy flair of the most important festival of the free music revolution. Well, howdy, friends! Here’s something for you. / Somethin’ about the festival, you know, / Spirit of Woodstock Festival is its name, / in Mirapuri, Italy it’s taken’ place. … and your heart and stomach to feel somethin’ else, / bringing’ to you somethin’ else / while looking into them / Big Festival Waves. And I’m there with my singin’ ladies / waitin’ for you to come to town / and a-gettin’ them and enjoin’ them / Big Festival Waves! / Big Festival Waves! Michel Montecrossa and his band The Chosen Few (Michel Montecrossa, Mirakali, Diana Antara, Mirachandra, Artis Aldschalis, David Butterfield) during ten days and nights are performing twenty concerts at the Spirit of Woodstock Festival 2012 in Mirapuri, Italy, from Friday July 27th till Sunday, August 5th 2012. Michel Montecrossa and The Chosen Few will present more than 160 brandnew songs from their ongoing New-Topical-Song and Cyberrock concert tour including the Festival title song ‘The Days of Love & Unity’, Cyberrocker songs like ‘Rescue Mission’, ‘Eyes Cascading Over Your Skin’, Country Hits like ‘No Fear! You Are Free!’, great Love Songs like ‘You Are My Girl – You Are The One’, profound New-Topical Songs like ‘In All There Is One Meaning’ and ultimate Dancedrive like ‘The Story Of That Girl’. Michel Montecrossa’s annual Michel & Bob Dylan Fest will also be part of the Spirit of Woodstock Festival with two concerts on Monday, July 30th and Thursday, August 2nd 2012. Michel Montecrossa and his band The Chosen Few play along with international guest bands creating together with them the stimulating and happy flair of the most important festival of the free music revolution. 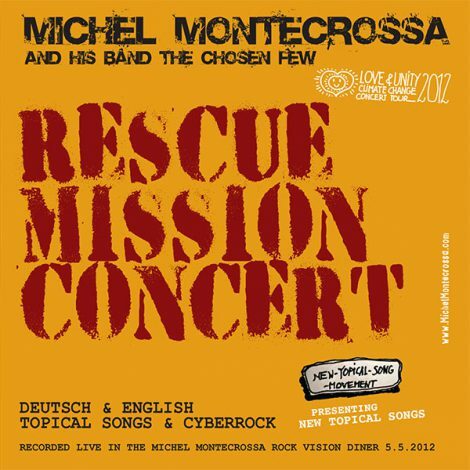 The ‘Rescue Mission’ New-Topical Concert released by Mira Sound Germany as Audio-CD and DVD, presents 32 New-Topical-Evolver-Songs by Michel Montecrossa, Mirakali and Diana Antara, taking a stand for Love and Unity as the final answer when all else has failed. The ‘Rescue Mission’ Concert is Michel Montecrossa’s fifth Concert of the Love & Unity Climate Change Concert Tour 2012 performed in the Science Fiction Rocker Basement of the Michel Montecrossa Rock Vision Diner in Gauting near Munich, on 5th May 2012 for the historic opening of Michel Montecrossa’s New Art Gallery & New Art Cinema. The 32 songs of the concert include the acoustic New-Topical-Songs ‘Talking Yulia Tymoshenko & Killer Politos‘ (New-Topical-Evolver-Song for amnesty and true statesmanship), ‘It’s The Ball‘ (Euro 2012 Song), ‘Politos And Bankas Don’t Give The Answer‘ (World Union is the answer! There Is No Crisis! World Union of the people will liberate all of us from the fake crises staged by politos and bankas created for scaring us into submission, poverty and slavery. ), ‘The Best Thing For America Reloaded‘ (For the USA presidential race Mitt Romney vs. Barack Obama), ‘Believe In Your Dream‘ (London Olympics 2012 Song) as well as electric masterpieces of celebrating humanity like ‘Rescue Mission‘, ‘No Fear! You Are Free!‘, ‘Cyberspeed Drivin’ U Sweet‘ and ‘The Day Is Comin’‘. 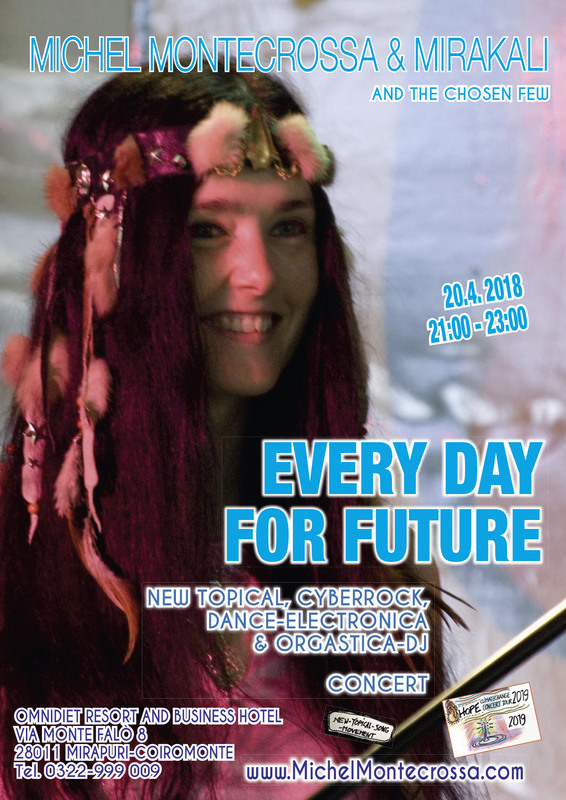 Mirakali and Diana Antara contribute superb Anti-Despair-Songs like ’Mysterious Earth‘ and ‘Time Of Our Life‘.